SAVE MONEY - Our bundle deals are great value, offering a huge discount on the individual purchase price. Includes uprights, base legs, shelves, brackets, kick plinths and EPOS ticket edges. 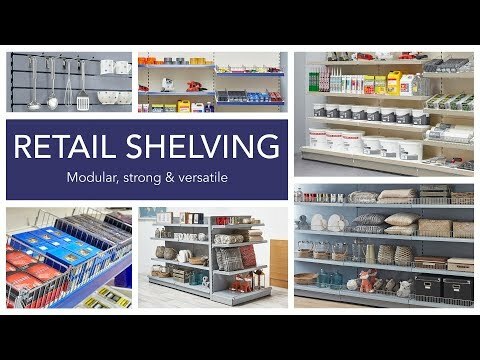 STANDARD 50 MM PITCH SHELVING - Our retail shelving uses the standard 50 mm pitch system, which means compatibility to existing shelving that is used throughout Europe. SUPERIOR FINISH AND EASY-TO-CLEAN - All of our units and shelves have a high-quality finish. This ensures a long-lasting product and makes them easy-to-clean for hygiene. EASY TO ASSEMBLE, EASY TO ADJUST - The units are simple and quick to install with only an assembly mallet required. The shelves are adjustable both in height and angle to maximise storage and display your products at their best. SOLID STEEL CONSTRUCTION - Reinforced shelves and sturdy construction mean a high load capacity, and with the superior finish, our retail shelving units are built to withstand the heavy, day-to-day use that commercial shelving requires. WIDE RANGE OF SIZES - Our wall units come in a variety of heights and widths to fit your available space. Contact our customer service team if you require assistance. VARIED RANGE OF ACCESSORIES AND COMPONENTS - We have a huge range of accessories and components, including kick plinths, EPOS ticket edges, risers and dividers. Additional shelving and uprights can be added easily to continue your run of units when you need to expand. Important! Heavy items are delivered kerb-side by one driver, who is not authorised to carry goods up or down steps or through a property. Due to the weight and size of these items you will need able people to unload them. For double pallet deliveries, a forklift truck may be required. Please call if unsure. Customers must have ability to park a curtain side or articulated lorry within close proximity to the delivery point. Please advise if your premises are subject to any parking restrictions or narrow roads not suitable for large vehicles in order that alternative delivery instructions can be pre-arranged as necessary. Deliveries to commercial addresses are delivered between 9am and 5pm. Deliveries to residential addresses are delivered between 9am and 6pm. You will be contacted to arrange a new delivery date. You may however be charged for a second pallet delivery, so please let us know beforehand if you will be unavailable for the scheduled delivery date. You will only pay one delivery charge per delivery destination regardless of how many items you order, how many packages are delivered or how many deliveries are required to fulfil your order. However, failed pallet deliveries may result in a redelivery charge. We also deliver to Europe. Please call us on 01258 859900or at the Checkout select your country and click Get a Quote for a delivery quote to your country.